Learn all the basic steps to make your first quilt! In this class you will learn rotary cutting 1/4" seams piecing borders basting straight-line quilting and binding. This class requires basic knowledge of how to use your sewing machine. You must be able to sew a straight(ish) line and completely thread (including the bobbin) your machine on your own. 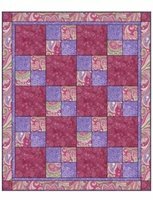 The class will use"Sew Quick Quilt Pattern" from Fabric Cafe. It will be available at Quilting Adventures. Three coordinating and contrasting fabrics. 1 1/3 cut of all fabrics (this will include the binding). This is different from the pattern requirements. -8 1/2" x 24" rotary cutting ruler. We recommend Omnigrip or Creative Grids brands. -Sewing machine must be in good working order. If you have not had your sewing machine serviced within the past year, please do so before class. -Piecing thread - Mettler Silk Finish, Konfetti, or Aurifil. Dual Duty will not work for quilting! All supplies (except some machine feet and painter's tape) are available at Quilting Adventures. We are happy to help you select the appropriate fabrics and supplies for your class and count on your support for this small, locally owned business in order to bring you high quality merchandise and excellent class instruction. As a student, you will receive a 10% discount on all supplies for the class in which you are enrolled.